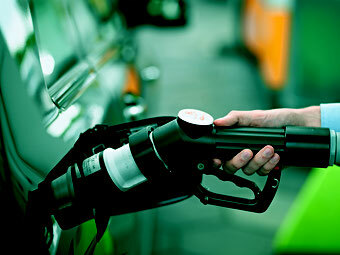 Drivers of hydrogen vehicles don’t really have to adapt at all, when it comes to refuelling. They simply drive to a service station with a hydrogen pump, and fill up with highly compressed gaseous hydrogen at a pressure of up 700 bar. The pump is connected to the fuel tank opening of the electric vehicle with a locking coupling. The driver simply presses the start button and everything else is automatic. Only three or four minutes are needed to refuel a vehicle. A fuel cell is a bit like a sandwich: between two plates, one of which acts as the anode (or positive electrode) while the other acts as the cathode (or negative electrode), there is an electrolyte layer. If hydrogen from the car’s tank is fed in on the anode side, and oxygen from the ambient air on the cathode side, the two undergo an electrochemical reaction in the fuel cell, producing water. The energy stored in the hydrogen is released as electricity. The fuel cell, which was originally invented back in 1839, is not only clean. It is also quiet. Fuel cells are smaller than combustion engines and are much more efficient. Fuel cell vehicles have a far greater range than battery-powered vehicles. And fuel cells can be used in larger and heavier vehicles like buses. Fuel cell systems are energy convertors. Unlike the combustion engine, which is based on thermodynamic principles, converting heat into kinetic energy or movement, fuel cells convert the chemical energy in hydrogen directly into electric energy which can be used to drive an electric motor. All fuel cell vehicles are thus electric vehicles – and highly efficient ones. They have far lower energy losses than conventional engines and today are already twice as efficient as vehicles with combustion engines. And they are just fun to drive – no gears, no noise and great agility thanks to their extremely high torque.